Major Bill Garlette retired to the Hampton Roads area in 2002 after serving over 25 years as an Army Band musician and officer. In his final tour from 1998-2002, he served as Deputy Commander and Associate Conductor at the United States Military Academy Band at West Point, NY. 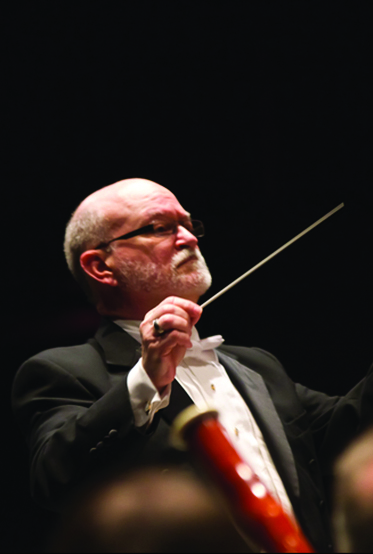 Since 2002 he has been involved as a guest conductor, clinician, and adjudicator throughout Virginia. Originally from Caldwell, New Jersey, Major Garlette holds a bachelor’s degree in music education from William Patterson College of New Jersey and a master’s degree in trumpet performance from the State University of New York. He also holds a master’s degree in conducting from Northwestern University. Major Garlette joined the United States Army as a trumpet player in 1977. His first assignment brought him to the U.S. Army Element School of Music, in Norfolk, Virginia, as a trumpet instructor and rehearsal conductor. He also served as a trumpet player with the 26th Army Band, at Fort Hamilton, New York; and the U.S. Continental Army Band, at Fort Monroe, Virginia. As an honors graduate of both the Enlisted Bandleaders’ course and the Warrant Officer/Bandmasters course, he returned, as a warrant officer, to the School of Music as the deputy director of advanced courses. In March of 1985, he received a direct commission. He subsequently served as staff bands officer, 4th Army Headquarters at Fort Sheridan, Illinois; executive officer and commander of the United States Continental Army Band at Fort Monroe, Virginia; and at the Armed Forces School of Music, as assistant commandant, commander of the staff and faculty company, and director of the Army band officer course. Major Garlette has studied conducting with John Paynter, William Revelli, Donald Hunsberger, and Eugene Corporon; and trumpet with Ron Anderson, associate principal trumpet player for the New York City Ballet. He has taught graduate classes at Old Dominion University, in Virginia, and at the Catholic University of America, in Washington, D.C.
Kim A. Williams Melby originally hails from Forest Grove, Oregon. She is currently serving in the United States Navy in Norfolk, Virginia as a network security instructor. both classroom ensembles and private instruction on clarinet, saxophone, flute, and recorder. Vinson (CVN70) in San Diego, California and Corry Station Pensacola, Florida.